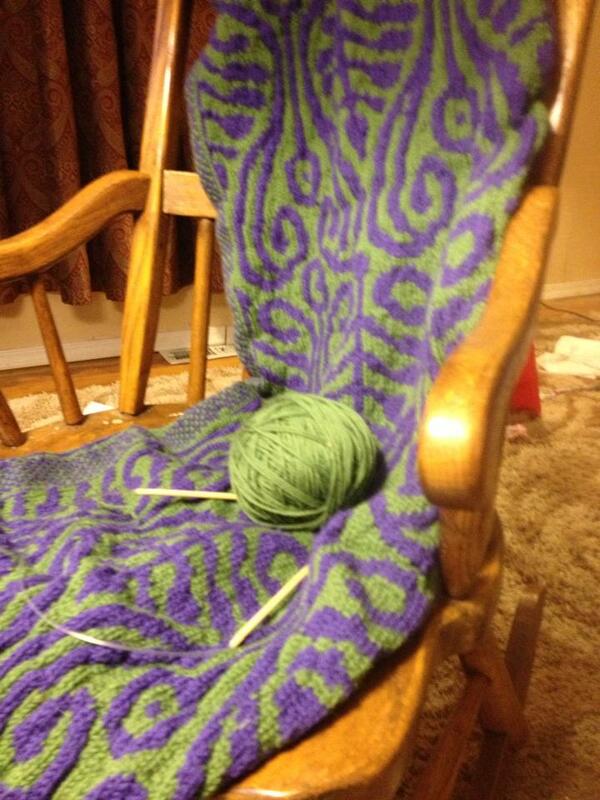 I learned to knit while I was in seminary. At first it was just simple stuff, so I could get the hang of things. But pretty soon I was looking for patterns with a challenge. It started with cables on a scarf, then I tried mitres, and finally I decided to pick up some colorwork. Not long after I got to Washington, I decided to try a pattern I’d been eyeing for some time. It was a blanket, in beautiful purple and green colors. The trick was that it used a technique called fair isle. You’ve probably encountered this technique at some point. If you’ve ever had a knit sweater with multiple colors, or a pair of socks, and noticed that the inside had strands that ran across it, and always caught at your watch or your toes as you put it on. That’s fair isle knitting. You use multiple colors, and carry the strands across the back of the work as you go, switching from one color to the next. Which works well enough for something with a definite front and back, like a sweater or a sock, at least if you’re careful of your watch. But for a blanket it raises difficulties. Because fair isle knitting has to be done in the round. Meaning that there is no beginning or end of a row, just a circle that you go around and around and around. As you go, you leave a central area that stays one color and lays flat, at the same spot on every row. It’s called a steek. And when you’re done with the knitting, you have to do a terrible, horrible, appalling thing. You have to cut the steek. You start at the bottom and you cut straight up the steek, all the way through, trusting the stickiness of the wool fibers to hold your hard work together until you can bind it all off with some final stitches. I finished this blanket about two years ago, maybe more. It took me over two years to finish. But I’ve never been able to bring myself to cut the steek. So I have this beautiful, intricate, elaborate…tube. I admit it, I’m scared. The idea of taking a pair of scissors to this piece of fabric is beyond daunting. It is paralyzing. So I haven’t done it. It sits there in my closet, rolled up in a ball until I can get up the nerve. I have become bogged down by the process, to the point where I have lost sight of the goal. This is what has happened to worship, according to the author of Hebrews. It has become bogged down in process, and lost sight of the goal. And there was a lot of process to worship in ancient Israel. He begins to describe just a little bit of it here. Before there was a Temple, there was the Tabernacle, the special tent that travelled around with the people. Two tents, in fact. There was the first tent, the outer tent, which became the outer courtyard when the Temple was built. This was where the lampstand and the table and the bread of the Presence were kept. It was a holy place, and the priests all came and went in that place. But beyond it was a second tent, an inner chamber, the Holy of Holies, where the ark of the covenant was kept, until it went missing when the First Temple was destroyed. Still, even in the Second Temple, the Temple that stood in Jesus’s time, the Holy of Holies was maintained, as the inner sanctum, the residing place of God, God’s throne room. In the First Temple, a wall stood between the outer room and the Holy of Holies. The Second Temple went back to the imagery of the tent, and put a curtain up to set apart the most sacred space in the Temple, really in all the world. While all the priests might come and go in the outer tent, only the high priest was allowed into the Holy of Holies, and only on one day of the year, Yom Kippur, the Day of Atonement. This was the day when the high priest offered sacrifices on behalf of himself, his family, and all of Israel. There was good reason for all of this ritual. But reason gets lost and muddled over time, and it’s hard to recreate the original beliefs behind these practices. There seem to be two sides to it, though. On the one hand, the people knew that they could not keep the laws that God had given them at Sinai. They knew that they would be imperfect under the law, impure under the law, and so they protected the sacred spaces that belonged to God, so that they would not defile God’s presence with their imperfections. On the other hand, God’s presence is dangerous stuff. Remember what Moses looked like when he came down off the mountain? His face shone so that he had to wear a veil over it because the glory of God had burned into his face. And he only saw God’s backside! He wasn’t even permitted to look at God’s face, because it would be too much for him. So only one priest, once a year, went into the Holy of Holies. Because God’s presence is overwhelming and frightening and transformative, and we need to be protected from God as much as God needs to be protected from us. We do this all the time. Protect ourselves, I mean. From transformation. From change. We put up walls, hang curtains, close doors, to protect ourselves, to shield our tender, fragile hearts from the alteration that might come if we opened. Have you ever had an argument with a friend, and had one or the other person walk out and slam the door? That closed door doesn’t just block out the argument, does it? It blocks out the relationship. As long as that door is closed, there is no hope of finding common ground, of offering or accepting apologies, of reconciling. The relationship is over, or at least on hold, until the door is opened. Because to reconcile, you’re both going to have to change. You’re both going to have to want the door opened. Our society has become a culture of closed doors. People are polarizing, becoming entrenched in their ideologies, and shutting the doors on one another. Rather than listening, really listening to one another, we shut each other down. One says “Black Lives Matter,” and someone responds with “All Lives Matter,” without stopping to ask what the first person meant. Without listening to their experience. An African-American colleague of mine posted on Facebook this week, reflecting on his experience with white people who only want to listen to him for 20 minutes, and then believe they have put in the time, when he has 65 years of experience as a black man in a white church to share. And no one can possibly understand his truth in only 20 minutes. When the door is only open for 20 minutes, we are not open to being changed. We are waiting to retreat as quickly as possible to the security of our certainty. To the fixed comfort of our ideologies. If we want to truly live for God’s kingdom, the kingdom in which all lives do truly matter, the kingdom in which every voice is heard, in which every child is loved, in which every individual is given the grace and the space to live up to their potential, then we are going to have to start by opening the doors, by propping doors open. By listening. By being willing to be changed by what we hear. Not just changed, transformed. And it begins, as so many things do, with worship. The author of Hebrews is calling the people to turn from dead works, from the process that stands in the way of their real encounter with the living God. They have allowed their process, their rules about outer courts and inner sanctums and proper sacrifices, to become the tail that wags the dog. It paralyzes them, bogs them down, and takes their eyes off their goal. Their entire lives are geared, not toward their relationship with God, but toward their need to serve the rules. They have put the paraphernalia of worship above the object of worship. 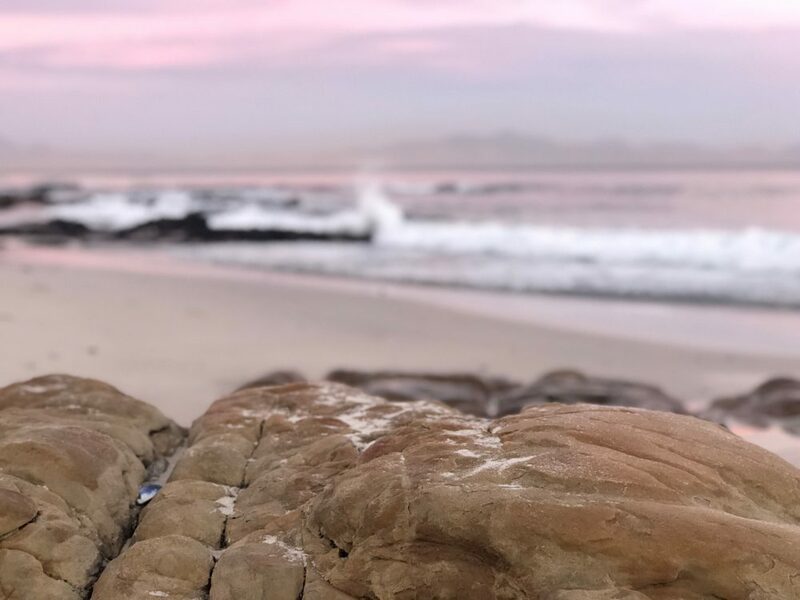 In Lutheran circles, we have a word for this – adiaphora. Adiaphora is Greek for “indifferent things.” Martin Luther used this word to mean those things that we do in worship that are not necessary. Adiaphora is all the process that surrounds our actual worship, all the trappings of our encounter with God. The music, the vestments, the seasonal colors, the kind of bread we use, the arrangement of the seats, whether the candles are lit left to right or right to left, these are all adiaphora. It’s not that they’re not important. They are! They help us, right? In some ways they are a gift. They set the mood for worship, they open us up to an experience of God in various ways. But they are not the point. They are not what we came for. Because, hopefully, what we came for was an encounter with the transformative power of the living God. 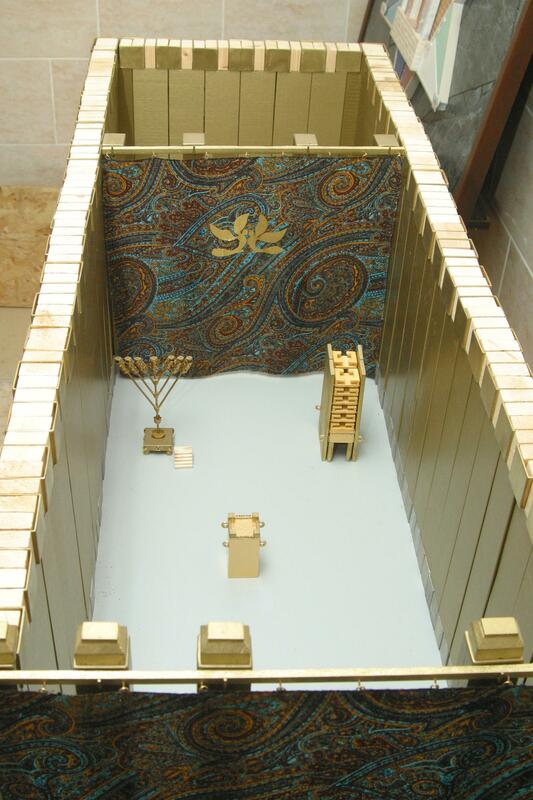 A glimpse of the Holy of Holies that will tear down some of the wall, that will tear down some part of who we are, and put God’s own heart in its place, if only for a few minutes. But unless it is doing that, unless it is ripping out your heart a little bit so God’s can fit in, unless it is delivering Jesus wrapped in the swaddling of grace, it’s worth asking the question: “Is this adiaphora?” Is this a process that has gotten in the way? Is this something that makes my worship time more about what I’m doing for God than what God is doing for me? Is this a door that I’m using to hold God out? The waking god may draw us out to where we can never return. And it is natural that we should hesitate to go there. It is scary stuff, abandoning the familiar and striking out into new territory, with only trust and hope as our anchors. Heck, I can’t even cut a blanket without dread, how am I ever going to put myself out there to be transformed by God? But it is not up to me to open the door. It is not up to us to tear the curtain down. Christ came as the high priest, and cut through all the stuff that gets in the way. Christ became one of us, became human, so that humanity would know – God is among us, in the tent and tabernacle of human flesh, and everything that we would do to protect God from us, or to protect ourselves from God, it’s adiaphora. It’s unnecessary. God has done all the necessary things, and the relationship is there. It is a done deal. Which means that we are free. Free to don our crash helmets, and lash ourselves to the pews, as the waves of God’s love crash over us and the doors are burst open, and the stones are rolled back, and the curtain is torn in two from the top to the bottom, and we are washed again, pulled on the riptide of God’s grace, back to this table every week, back to the waters of baptism, where the old sinner is drowned anew every morning so that we might rise again to face that day, transformed. Transformed and free.